You need "A little love cup" for Valentine's Day! In a double boiler, or in a medium metal bowl, set over a gently simmering pot of water, add the chocolate melts and allow the chocolate to warm and begin to melt, mix with a silicone spatula to ensure all the chocolate is melted. (You may also follow the directions on the package on how to melt the chocolate.) Once the chocolate is melted, use a ladle and fill the silicone molds half way and tip the mold towards yourself to bring the chocolate to the edge and continue to turn the mold clockwise, making sure that the inside of the mold is covered in chocolate. You can do this a couple of times to make sure that there is a thick enough coating of chocolate. Since these are so delicate, I would suggest making as many shells as you can in case you break some when you unmold them. Finish the remaining cups and set them aside to completely cool and set. Using a paring knife, run over the top edge of the mold so that top of the mold is clean of any chocolate which will create a cleaner look for your chocolate shell. Once these are cooled and set, I suggest allowing them to sit at least 2 hours before unmolding. You can make these the day before. When ready to unmold, gently pull the edges away from the chocolate all the way around the shell. Flip the mold over, using both hands and slightly keeping the side of the mold away from the chocolate while gently using your thumbs to push on the bottom of the mold to slowly and gently release the chocolate from the mold. The mold may crack slightly, as long as it doesn’t crack in half, continue to gently push on the bottom till it fully releases. Leave in the mold if you are not going to use it right away. If made the day before, store in an airtight container in a cool, dry area. In a small heavy bottomed sauce pan over low/medium head, add the preserves, water and sugar and stir. (If your preserves are sweet enough, you do not need to add the additional sugar). Prepare a small bowl and sieve and set aside. Once the preserves have melted, pour the mixture into the sieve and strain till you only have the seeds left in the sieve. Toss the seeds. Clean sauce pan of any excess seeds if necessary. Add the strained preserves back into the sauce pan and gently simmer and continue to cook until thickened, about 3-5 minutes. Add the Chambord, mix until combined and remove from heat and set aside. This can be made a day in advance and stored in an airtight container in the refrigerator. Bring to room temperature or slightly warm prior to serving. Note: You may combine the total amount of preserves and cook it down so that you only have to do this process once. Just remove 2-3 Tablespoons of the seedless preserve to set aside for the Raspberry Mousse before adding the Chambord. Follow the above directions for the Raspberry-Chambord sauce, or as suggested, make all at once. In a medium bowl, add the Cool Whip and gently fold in 2 – 3 Tablespoons of the cooled raspberry preserves. Do not mix, you must gently fold the preserves into the Cool Whip to combine. Once it is combined, refrigerate, covered until ready to serve. This can be made a day in advance and stored in an airtight container in the refrigerator. In a small heavy bottomed sauce pan over medium/high heat, add the water and sugar and bring to a boil. Continue to cook until all the water has evaporated and the sugar begins to thicken, enough to coat a spoon. Remove from heat and add the vanilla bean paste, stir until fully combined. Set aside. But mousse in a piping bag or Ziplock® bag, cut off the tip. This will make it easier to pipe the mousse into the chocolate cup. Use a small spoon for the slightly warmed Raspberry Chambord sauce. In a small bowl, add the berries and pour enough vanilla bean essence to just coat the berries. Using a silicone spatula to gently toss and coat the berries completely. Set aside. On a large white plate, put your shell on the plate closer to the middle top right, pipe in the raspberry mousse and fill almost to the top leaving about 1/2”. Gently put the berries on top of the mousse and cover the entire top area so you do not see the mousse. In front of the chocolate cup, starting at about 9 o’clock on the plate, using your spoon, put a medium sized dot, about ¼” or slightly larger, then a slightly smaller dot at 8 o’clock and yet another slightly smaller dot of sauce at 7 o’clock. Once you’ve made your dots, take a toothpick and run it through the dots starting at the top of the 9 o’clock dot and just continuously going into the 2nd and 3rd dots. This will give the illusion of hearts. 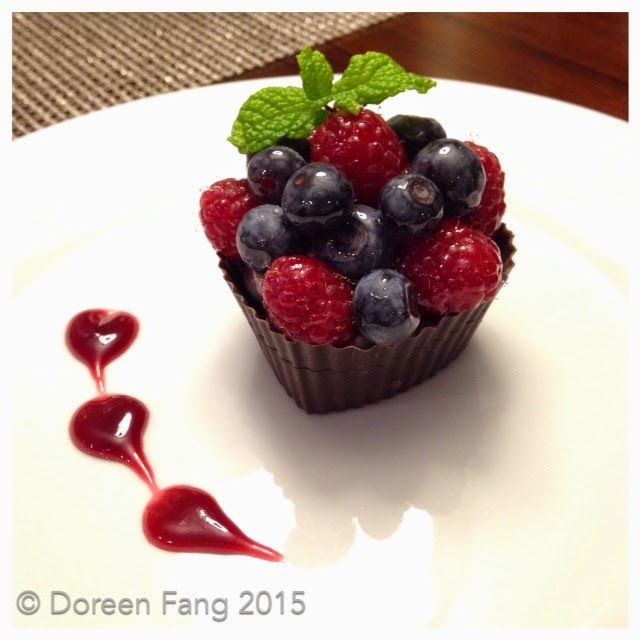 Finish the dessert by placing a small sprig of mint on the berries for garnish. Notes: I know this process may seem tedious, but the outcome is worth the work. If you have a favorite chocolate and are comfortable with tempering it versus using the candy melts, please use it. Also the same goes with making your own mousse versus using the Cool Whip. These are just suggestions to make it a little easier to make and less time consuming for those of you who are too busy and don’t have enough time.